This corded plug in motion sensor light is great when you don’t want the fuss of installing something permanent. If you have a work bench in the garage, or other occasionally used locations like shed lighting, attics, and basements where you have electricity but wiring is inconvenient, where solar powered motion lights won’t get enough light, and battery powered lights just don’t put out enough light, then this is likely your best option. To my knowledge this is the only light of its kind, although it would also be easy enough to rig something with a motion sensing outlet or motion sensing light socket adapter. The cord (grounded) is a bit short at eight feet, so you may also need an extension cord for those hard to reach places. This is a 100 Watt halogen floodlight, so it’ll be plenty bright. The motion sensor detects within 110° , and according to the manufacturer, up to 60 feet away, but I wouldn’t count on that range. It has dials for sensitivity and duration, though I’m not convinced they have much effect. Bottom line: What it lacks in features it makes up for in convenience. 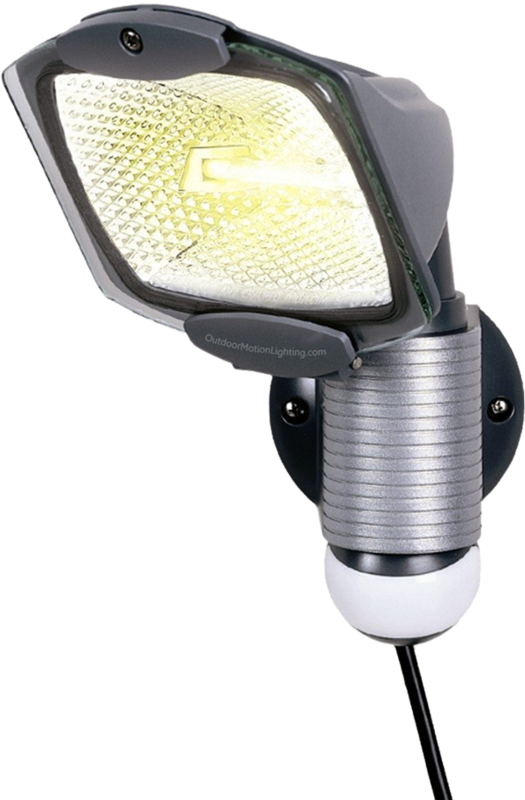 The Cooper Lighting MS100PG Plug-in Motion Floodlight has a metal and plastic housing and should hold up alright outdoors, so long as you don’t leave the extension cord in a puddle. You can find this light for sale on amazon, with prime shipping.